Other than those two days, I've been doing great! I feel nausea and lethargic sometimes, but that's just it. I haven't been vomiting since. Drink juice! Orange or apple works for me because of the slight sour taste. Cold Lipton Ice Lemon Tea! Always ensure that my tummy is filled up. When I'm hungry, the gas in the tummy can really lead to vomiting. Get my mind occupied. When in the office and I'm all focus on work, somehow I don't feel like vomiting that much. I'm feeling much much better today. After 2 days of throwing out everything I ate, doctor gave me the rest of the day yesterday to rest and gain back some energy. I came back home, slept for 3 hours straight. Woke up and forced myself to eat. It was really really hard for me to eat. I had to chew the bread slowly and then forced them through my throat. And it didn't feel nice at all! After one bite, I rest for a few seconds, then I had another bite. After 5 bites, I stopped. Drank 100Plus to restore back all the energy lost, and then had some more rest. I was very very weak. All that time, I said to myself "Is this how its going to be the coming month? How do I cope with this?" Whatever it is, I had to force myself to eat, for me and the baby! However, thank God, I gained back my appetite during dinner and so I ate whatever I can take, drank all the fluids that I've lost and today, I woke up feeling much much better. I had the energy to go through the day at work smoothly. Alhamdulillah! I even had the crave to eat kari daging that the minute we reached home around 6pm today, I went to the kitchen and cooked it rightaway! We had lamb curry for dinner today! Hah amik kauuuu! 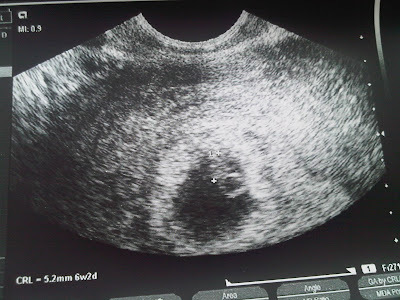 Last 2 weeks, I tested positive on the home pregnancy test, however when we visited a nearby family clinic, the doctor could not see any sac (i.e space) in my uterus. I was supposed to be 5 weeks then. The possibility of a false positive test is very low, and we did the urine test twice - both showed positive results. However, there was also a possibility of a miscarriage. So i was quietly worried. "Come back next 2 weeks, and we'll do another ultrasound scan on your tummy," said the doctor. So we left the clinic, not too sure if it was good or bad news. However to both our parents, positive urine test is of course good news! So you can imagine all the 'what-to-eat' and 'what-not-to-eat' warnings I get. "Make sure you don't jump around too much, don't go to the gym! Swimming is okay. Don't go up the stairs too many times...yadda yadda yadda." Truth is, the first trimester is the most sensitive period of the pregnancy, where 30% end up in miscarriages. So, reluctantly, I followed their advices. It seems that everyday, I learn something new that I CANNOT do or eat. But I trust them, as they're more experienced than I am. Petua nenek moyang, ada baiknya kalau diikut! I started having constipation and fatigue - but I was eating well alhamdulillah. However, last 2 days, the nausea and vomiting started. I vomited every thing I ate. So today, I was totally flat out. This morning, we had our first appointment with the gynecologist at Sime Darby Medical Center (SDMC). I chose Dr Delaila Ahmad as I've heard a lot of good feedbacks about her! I was praying hard that everything was okay, that the doctor could see the embryo in my uterus. That dark area is the sac. And the embryo is in the small white circle area. Many of my family members and close friends have learned of this good news. Some are telling me that I shouldn't tell everyone else until I pass the first trimester, the most sensitive part of the pregnancy. Please pray both me and my baby will go through the first trimester fine. I put my faith in Him. Oh my, motherhood coming soon! I just completed reading "The Monk Who Sold His Ferrari" by Robin Sharma. This book was first published in 1997 and has sold around 3 million copies world wide. I was looking for a new book to read after completing the 600 pages of Steve Jobs by Walter Isaacson. A different genre actually but nonetheless, it was still a good book although I wouldn't rate it more than 4 stars from total 5. 1. To form a clear mental image of the outcome. a. If it is about losing weight, envision yourself as someone lean every morning. Ok. Let's try this and see the end result in 3 weeks time. This Ramadhan, my parents has decided to leave all of us behind, while they go for their 5Xth honeymoon at the beautiful island in the Phillipines : Palawan. For instance, I didn't attend any Terawikhs in the mosque for the past two days. Truth is, it has never been a practice in my family before, thus its something new that I'd like to try. However, I attended Subuh prayers at the USJ9 Al-Falah surau today, read some Quran, and stayed back to listen to Subuh tazkirah. Both days, I failed to stay up after Sahur and ended up sleeping back after Subuh prayers. I don't know how this is going to be during working days. I'm just too sleepy after that! Maybe I need like 5-10 mins nap. Or maybe I just need to sleep earlier. Tahajjud - I guess this will happen when I decide to wake up slightly earlier for Sahur. Cooking for buka - YES this one I'd LOVE too, hopefully I don't get too caught up in work that I leave the office late. I used to look forward on what to cook everyday during the fasting month when I was studying in Sydney.....teringin teringin, google resepi, masak, makan...puas! I'm lucky to still be staying with my parents where there's a maid to assist with all these cooking, prepare and wake us up for sahur. But someday, when we move to our own house, I will need to do this on my own. With children around, I also need to prepare them for nursery/school, and then I need to head to the office and also later on, prepare dinner for the whole family. There will also be other daily house chores which I need to do. I know Mr will assist me but the responsibility is really on me. I RESPECT WORKING MOTHERS - and I hope that I will be able to cope with that too as time comes. I'm slowly fitting in, improving myself, in carrying out my responsibility as a wife..and I will also slowly do that to when being a mother, insyaAllah. This morning, Mr's phone alarm went on and on that I sat up and said sleepily, "Yang.....! Alarm clock tu!" He opened up his eyes, and then he smiled and said, "I love you..." and then went back to sleep again, leaving the alarm beeping. At that particular moment, I didn't know whether I should smile or still be annoyed. Of course seconds later, I woke him up again.."Yang....Alarm tuuuuu!!!!" He took the phone from his side of the bed and gave it to me.."NAH! "...and it was still beeepinnnng! CIS!